There is only one rule in home exterior design: There are no rules. CertainTeed offers more than 40 fade-resistant color choices to bring your home to life. From warm and inviting to blended hues, the optimal color blend has the power to bring out the best features of your home. For a peaceful look, opt for blues, greens, and cool grays. Trim in a neutral tone provides a striking counterpoint to colorful siding. Warm tones like red, yellow, and brown give your home a welcoming feel. CertainTeed Monogram or Cedar Impressions blends are available in these tones. A dark roof paired with walls in a light color like marigold adds visual distinction to homes with simple designs. If your home’s exterior has a lot of design elements, a monochromatic approach will simplify its appearance. For large structures on tight lots rich shades of brown, green, and red make your home appear smaller while adding drama. Use colors on the lighter end of the spectrum to add volume and interest to smaller homes and soften sharp edges. A virtual swatch book, ColorCoach™ is a simple tool designed to give you more confidence in your color choices. Make product selection a breeze with our CurbAppeal™ app for the iPad®. Review and select colors, styles and textures. Browse a gallery of homes for inspiration. 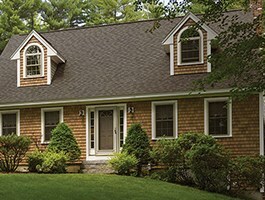 Explore color blends and solid colors for CertainTeed Cedar Impressions® Individual 5” Sawmill Shingles.